The articles/EMOs kept in deposit can be delivered through window delivery. 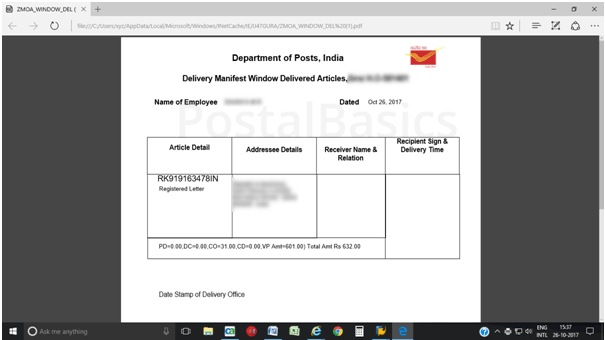 Window delivery of articles and EMOs are given under window delivery for accountable mails and window delivery for money order option. 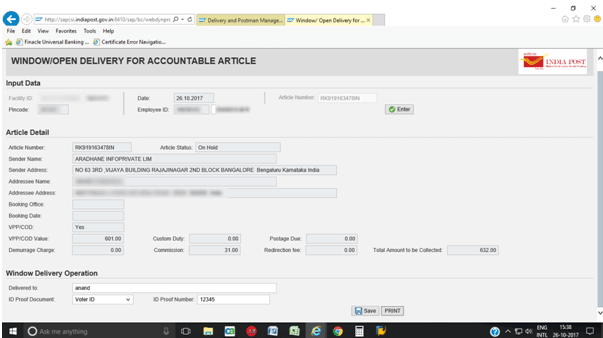 Click on the Window Delivery For Accountable mails link. The below window will show up. Scan the article and all details will be shown. Enter the details of Delivered to, ID Proof, ID Number. Take the print of it. Similarly, If you want to give a window of a EMO then, follow the same procedure as explained above. Once you save the data of that particular EMO, the amount will directly effect the TCB. Cross check the amount before the payment. This is how you can give window delivery of an article/EMO.